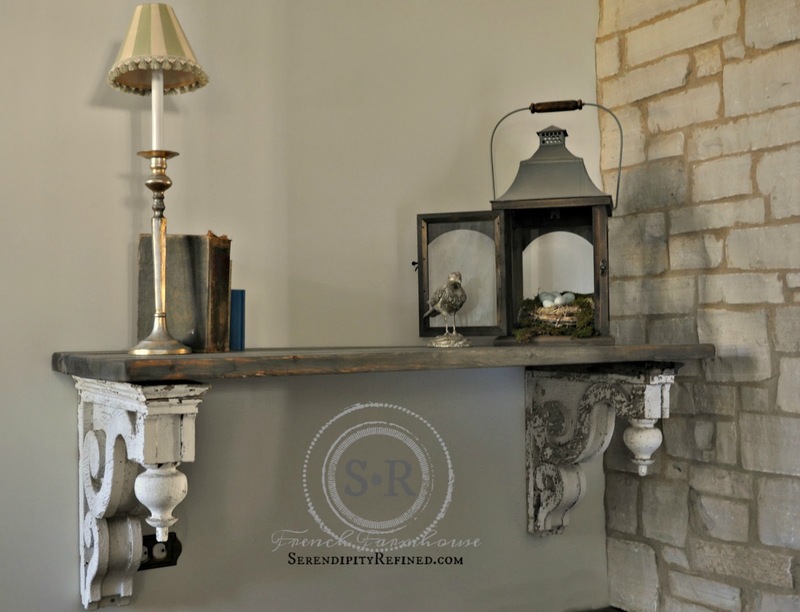 As soon as the limestone wall in the foyer was finished, I knew that I wanted a different kind of foyer entry table. 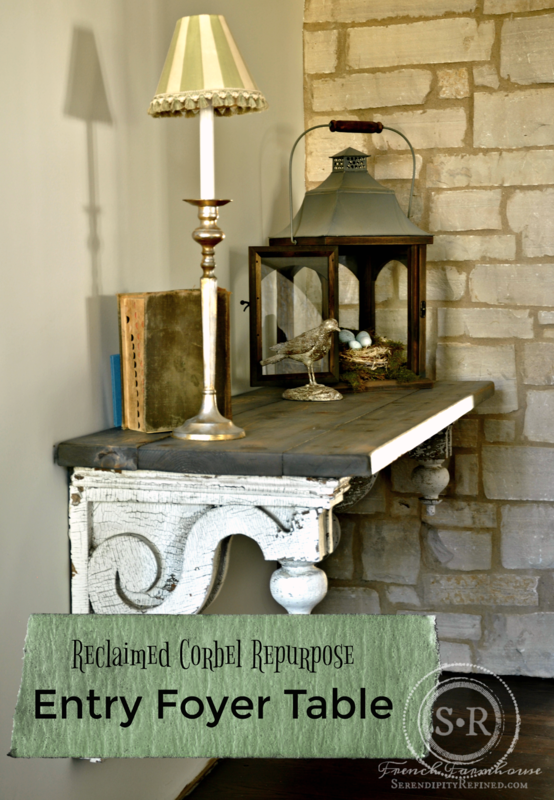 I had a couple of great pairs of chippy white reclaimed architectural corbel brackets that had been hanging around for a few years waiting to find a home and I knew that I could DIY a simple repurposed table in just a couple of hours using a pair of brackets and some pine for the top. 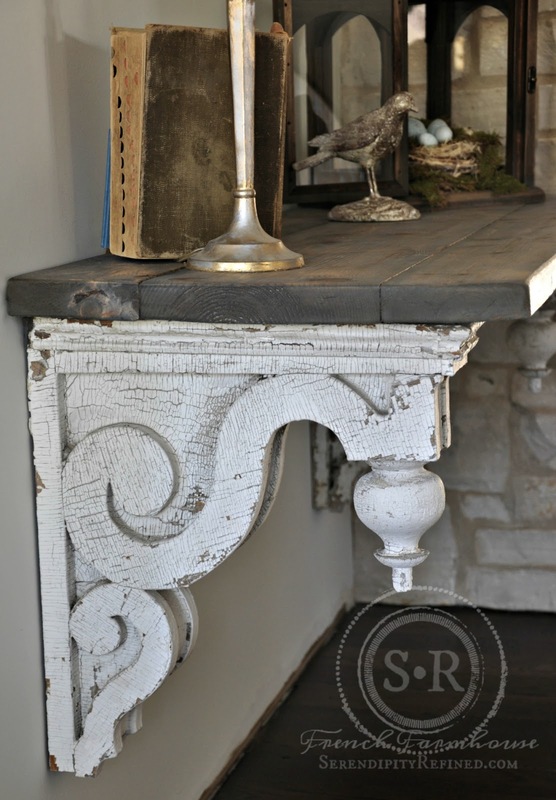 This particular pair of brackets, in all of their perfectly white, crusty, rustic, glory were salvaged from an old home before it was demolished by my friend, Jeremy (If you find that you're in the market for a pair, I happen to know that he has more....you're welcome). UPDATE: as of tonight, the 8 that he had remaining have been purchased by readers of this blog! I'm so excited! I knew when I held them up to the wall that they were perfect for the space. I mounted them by drilling through the brackets into the wall studs. The top is made from brand new pine 1x8's that were roughed up, stained with Weatherwood stain in oaking and then sanded and waxed with clear wax. You may recall that I used Weatherwood on our cedar garage doors and all of the exterior cedar on our house. 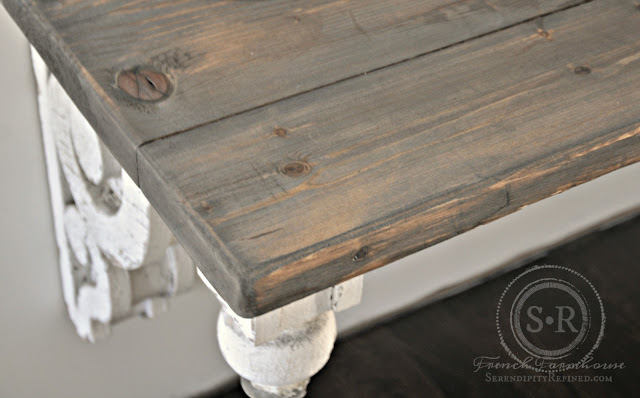 This is a product specifically made for Oak and harder woods but it works beautifully on pine as well to give it a great gray finish. The contrast of the chippy brackets, the gray of the wood top and the limestone lend a warm, rustic feel to the foyer without being either too formal or two casual. It has already become a great spot to drop the mail or the car keys. It's also really nice to have a place to create a simple spring vignette. 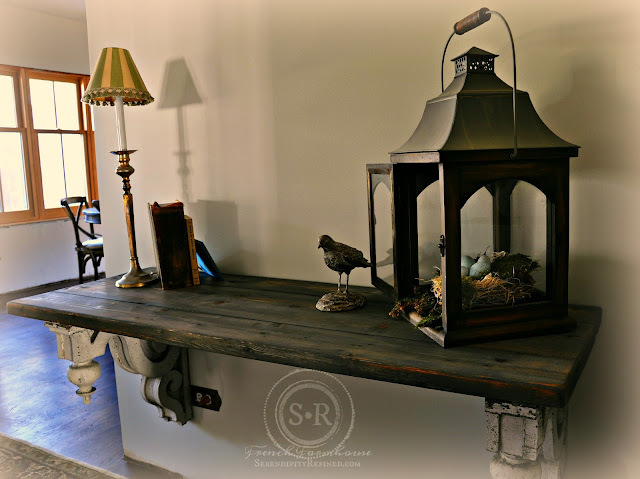 I'm not doing too much decorating this year but there are a few spots where I'm adding some spring touches and I thought that guests might enjoy a little touch of spring when they enter our home. 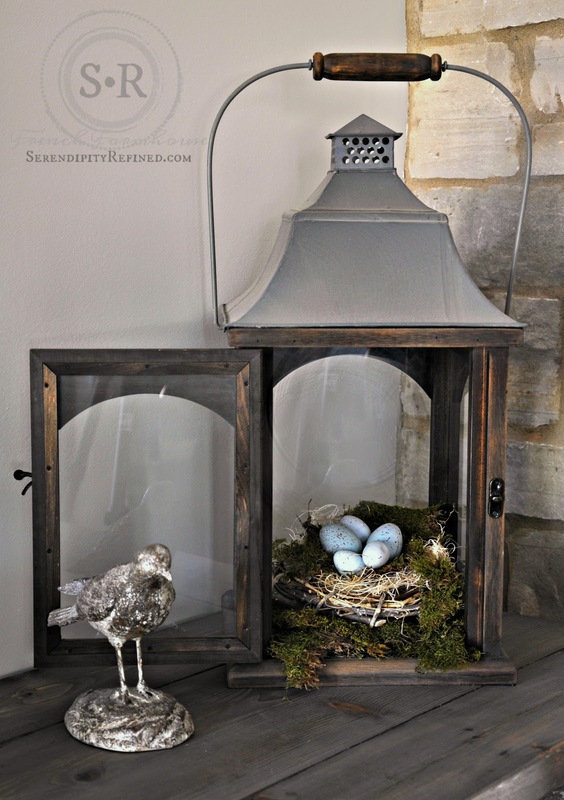 I placed some sheet moss in the bottom of my lantern and created a bird's nest out of a small grape vine wreath, some sisal and moss. 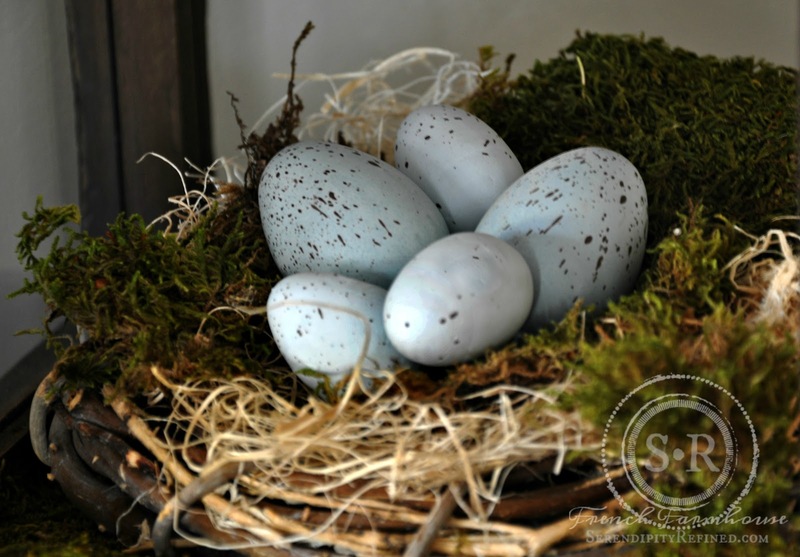 I added a few blue speckled eggs that I painted with a mix of chalk paint and speckled using an old tooth brush and a little brown paint. I found a robin statue from a few years ago, added my mom's old dictionary, a couple of bird books and a small lamp. 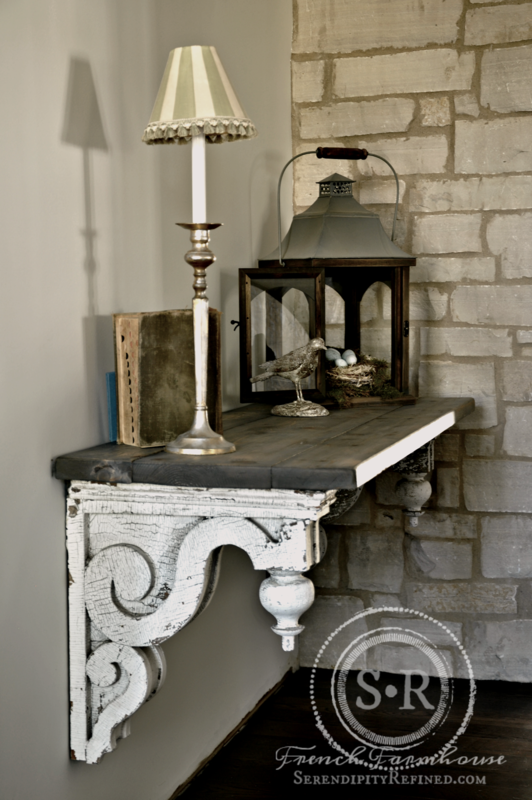 I'm still looking for the perfect French mirror (either trumeau or just a simple arched top one...I haven't decided yet). Also on my list of things to find is the perfect tufted bench for beneath this table. I think that it would be nice to have a spot for guests to remove boots when the weather is bad. 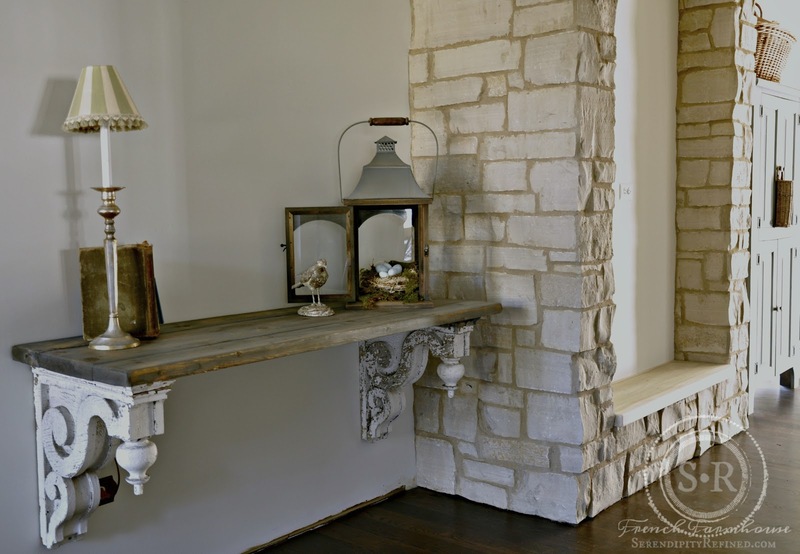 Up next, we're building floating book shelves out of poplar inside the recessed area in the stone arch. I'll share progress as we build them and I'll write a post with the mechanics of the process. We were pretty excited to have our brother in law suggest that rather than drilling the limestone to put in pegs, we should drill lag bolts into the studs...DUH...so much easier! Supplies were purchased yesterday and I have a friend who will let me use his drill press to drill the holes so who knows...maybe in a week or two, I'll have some shelves to put the books on...as you can tell from the photo above, we've already scribed and cut the bottom shelf. By comparison, the rest should be easy. I hope you enjoyed this little peek into our foyer and the chippy, crusty, rustic DIY entry table that we made from reclaimed corbels and pine that I distressed so that it looks old. I'm working to get back into a more regular pattern of posting but I'm not quite there yet. Thanks for hanging in there with me.